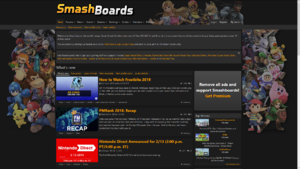 Smashboards, also formerly known as Smash World Forums or SWF, is a forum devoted to the Super Smash Bros. series, allowing users to discuss strategies, as well as find and host tournaments. In addition to helping players organize tournaments for the games, Smashboards is notably where the most widely-accepted tier lists are published. First opened in 2000, the website has over 250,000 members, making it the most popular Super Smash Bros. forum on the internet. Despite its age, Smashboards remains active, and alongside Facebook, it remains one of the most active hubs of activity for Smash. Prior to the formation of Smashboards, Gideon, a thirteen year old smasher, created Smash World in 1999, a website devoted to Smash 64. One year later, he founded Smashboards.com as a companion site, hosted by UBB.threads. Initially referred to as the "Smash World Forums", Gideon founded the site as to help players of Smash 64 talk to one another, as well as allow smashers to discuss the then-upcoming Melee and his upcoming site, Super Smash Bros. Melee World; Gideon also had one board dedicated to The Battle Arena, a side project of his involving Flash animations he created with his friends. In addition to its standard boards, a Back Room was also created for certain users who had proved themselves; this Back Room would later go on to form the Back Rooms of later games, which would decide the tournament rulesets of games, as well as the tier lists for the games. After the release of Melee, the first tournaments were organized on the SWForums, owing to its large playerbase and its ability for any player to potentially view topics about tournaments. Initially starting off as small, local affairs, Matt Deezie is generally credited with starting the national scene by using the forum to communicate with players outside of his native California, inviting users from as far away as Illinois to attend his tournaments. The site also allowed users to communicate with overseas players, creating an international scene for the game as players in North America, Europe, and Japan began to invite each other to their respective countries for Melee tournaments. With the continued expansion of Melee's tournament scene, the game was eventually picked up by Major League Gaming in 2004, who helped promote the site and further assisted in making Smashboards the world's largest forum and community devoted to Smash. The site continued to rapidly expand following Melee's inclusion in several MLG events, including the opening of Super Smash Blog, a website devoted to Brawl's development after its showcase at E3 2006, and opening SmashWiki in March 2007. The MLG kept Melee in its circuits for many years, only dropping the game in 2007 due to declining interest in the Nintendo GameCube and the development of Brawl underway. In September 2008, with Brawl having been released worldwide and beginning to be analyzed as a tournament game, the MLG purchased the forums from Gideon in September 2008 for an undisclosed sum. While the move allowed Smashboards to gain servers that were less prone to crashing than before, a large number of threads and posts from before 2008 were also lost in the transfer. As a result, information about many tournaments held before 2008, and similar topics, have been lost. Furthermore, the forums's original namesake, Smash World, and all of its variants, were all shut down at this time. In 2011, the forum was officially renamed Smashboards, after its domain name, though the term "SWF" is still sometimes used as a shorthand for the board. On November 27, 2012, Major League Gaming officially ended its involvement with Smash by selling the website to AlphaZealot's company Xyelot LLC. With the upcoming release of Smash 4 in 2014, Smashboards expanded to act as a news network for Smash in general, covering the release of Smash 4, tournaments for the various games, and promoting videos of players on YouTube. A sister site to Smashboards, Squidboards, was launched in 2015, serving as a Smashboards-style forum for the Splatoon community. As of 2018, the following boards are available on Smashboards. All of them can be immediately posted in, with exception of the Back Rooms. In addition to the above categories, a further category of forums are present on Smashboards, the Smash Back Rooms. The Back Rooms are only accessible to specific users who must apply to be able to view and post in these forums; a majority of users of the Back Rooms are generally highly-regarded tournament organisers or high-level professional smashers. The Back Rooms can be considered somewhat of a central governing body for competitive Smash in North America and Europe, and the Back Rooms produce the most widely-accepted tier lists and publish the official tournament rulesets for the games. The Back Rooms also made the official matchup charts for the games, though the last matchup chart to be released was Brawl's in 2013. Smash 64, Melee, Brawl, and Smash 4 all have their own dedicated Back Rooms, as does Project M. The Brawl Back Room also formerly featured its own offshoot, the Unity Ruleset Committee, which attempted to create a universal ruleset for Brawl tournaments. Initially accepted, the URC's decision to ban Meta Knight from Brawl tournaments later led to fractures in the Brawl competitive community, and the URC later disbanded in April 2012, owing to its failure to create or foster a truly universal ruleset for Brawl. In 2015, Smashboards became Shaqboards, which made everyone's profile picture into images of Shaquille O'Neal while character mains became emoticons of Shaq. Tier Lists for the game Shaq Fu were posted as well as a guaranteed Luigi misfire tech being discovered. In 2016, Smashboards would become Emblemboards as an inside joke to the huge amount of Fire Emblem characters present in the Super Smash Bros. series. It made everyone's picture into images of characters from the Fire Emblem franchise as well as turning character mains into emoticons of characters from said franchise. Users notably tiered waifus and husbandos during this day. In 2017, Smashboards became Knucklesboards as an inside joke to Knuckles the Echidna, who was intended for inclusion in Project M before development of the mod ceased in 2015. Each user had their picture changed into artwork of Knuckles from various Sonic the Hedgehog games, while character mains became an emoticon of Knuckles. Tier lists were notably based on Knuckles' appearances in Sonic the Fighters and Sonic Battle. In 2018, Smashboards became Ridleyboards, as a reference to the continued popularity and inside jokes surrounding the Metroid character Ridley. On April Fools, each user had their avatars replaced with images of the beast, which were oversized to the point where only portions of the actual character could be seen, as a reference to the recurring "Ridley is too big" comments when discussing his potential as a playable character. On top of this, the forum's text became purple and was enlarged, once again to reference the inside joke. Ridley would be revealed as a playable character for Super Smash Bros. Ultimate two months afterwards. In 2019, Smashboards became Reggieboards, dedicated to the then-Nintendo of America president Reggie Fils-Aimé. The site's banner, background, and users' avatars were replaced with images of Reggie. (Note: only the banner and title are archived.) A facetious article was also written, saying that he had signed onto Team Liquid. Players first discovered and discussed wavedashing on Smashboards. Its use as a technique was widely attributed to a Smashboards user named Toadbanjoconker, who posted a video of him performing it back in April 3, 2002. During December 2005, Grimer icons started to appear on people's avatars and signatures. To turn his website into a business, the owner of the forums, Gideon, started to sell "Premium Memberships", in which members would pay to get special avatars and custom titles. The highest price (Diamond Membership) even got members into the Back Room at one time. This page was last edited on April 17, 2019, at 19:21.